Whenever I poke around on Pinterest I can't help but pay extra attention to recipes that I would like to try. One of those recipes that I saved and tried was Mario Batali's Eggs in Hell. 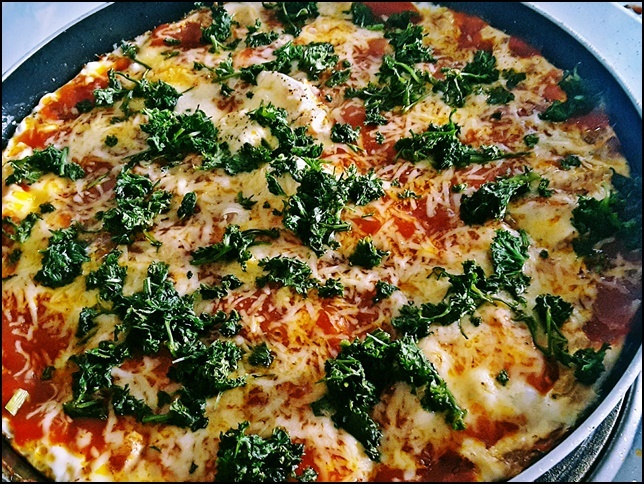 Eggs in Hell is an egg and vegetable recipe that is based on the North African and Arab meal called Shakshouka. An Arabic word that means mixture, Shakshouka/Eggs in Hell is a mix of eggs cooked in tomato sauce, chili peppers and onions. Mario Batali is an American chef (who has had his share of sexual misconduct allegations recently) who shared this recipe on the TV show The Chew. Prepare the olive oil on a skillet at medium to high heat. Leave on until it is slightly smoking. Add the onions, garlic and chili flakes until softened and light brown. Place tomato sauce and allow it to boil. Let it simmer then crack eggs one by one into the sauce. Use salt and pepper to taste and cook until eggs are set to preferred consistency (some say it should be more of a poached thing, but I prefer cooking it a little more than that). Allow it to cool then serve the meal in the pan and add the cheese and basil on top. According to my family (who love and support me no matter what I do), the Eggs in Hell was very good. The kids enjoyed it and I was happy that I made them happy. Still, I know that I could have done better to improve my version of it. For one, I'm sure that using a cast iron pan would have made a difference in how the recipe was cooked. Using basil that was fresh instead of slightly wilting (because there wasn't anything else available) would have made a big difference too. It ended up a bit watery and I couldn't chop it properly. Fresh Parmesan would have given it better flavor too. Would I try this again? Yes, I would. I'd try to improve on it but I will definitely try it again. If you enjoy tomato-based dishes or eggs in particular, you would probably enjoy this recipe. I'd recommend it since it is a fairly easy thing to cook and takes a very short time to prepare. I may not like Mario Batali because of the things people are saying about him, but this recipe is pretty good.